Getting Your Share: "Love the one you're with"
Here it is. My very first CSA box. Alas, no peaches. Now if you are scratching your head thinking "hmm, I thought this was going to be stone fruit." Well, you are right but we just aren't quite there yet. 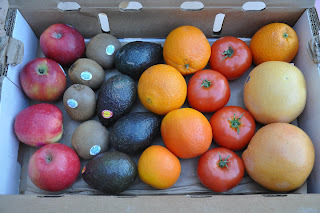 Frog Hollow supplements their boxes with fruits from organic growers they know when their fruit isn't ready. So while I am very excited about the avocados and my girls are already requesting kiwi for tomorrow, I am not such a tomato or grapefruit fan. But I'm determined to find something to do with them. The tomatoes should be easy. The grapefruit might present a challenge. I'll have to keep waiting for peaches. * With a knife, cut away the peel and white pith of the grapefruit and orange and slice the fruit into rounds. * Arrange the slices on individual plates. Drizzle with the honey and top with the mint. I've had this before with grapefruit only and it was excellent.